With a stay at Hotel Phønix Brønderslev, you'll be centrally located in Bronderslev, 10.3 mi (16.6 km) from Borglum Abbey and 12.8 mi (20.6 km) from Faarup Sommerland. Featured amenities include express check-in, express check-out, and multilingual staff. Planning an event in Bronderslev? This hotel has 538 square feet (50 square meters) of space consisting of a conference center and a meeting room. Free valet parking is available onsite. Located in Grasten, Kværs Kro is in a rural location, within a 10-minute drive of Grasten Palace and Adsbol Church. Free self parking is available onsite. With a stay at Kapelvej Apartments in Copenhagen, you'll be within a 10-minute drive of Tivoli Gardens and Stroeget. 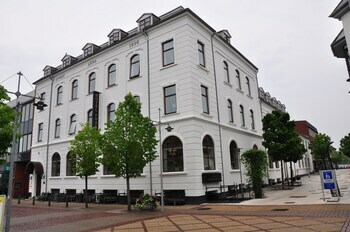 Located in Ronne, Rønne Vandrerhjem is by the sea, a 2-minute drive from Defence Museum and 5 minutes from Store Torv. Free self parking is available onsite.